Our staff is friendly and of the highest integrity. We've been Saint Petersburg's COOL choice since 1986. Learn more about this great savings. From installation to duct cleaning, Hale's Air Conditioning Services Inc has all of your service needs covered. From the beginning, Lennox has been building HVAC systems with the highest standards of quality and innovation. Whether it’s the SunSource® Home Energy System or the first air conditioner with a SEER efficiency rating over 25, we’re constantly trying to set the bar higher than ever. Creating the most comfortable home has always been a main priority for the team at Hale's Air Conditioning Services Inc, and we want to help you take your home’s comfort to the next level. Whether you want to have the highest efficiency out of all your neighbors or you’re simply looking for the perfect heating and cooling upgrade for your budget, we have a solution for you. When you decide on Hale's Air Conditioning Services Inc you know you’re going to get the best heating and cooling repair and service offered in Saint Petersburg. It’s no wonder that Lennox brings a reputation of quality and efficiency, given its 100+ year existence and history of being on the leading edge of heating and cooling innovation. Feel the difference, with Hale's Air Conditioning Services Inc.
We are the proud recipients of the Lennox Training Excellence Award. We pride ourselves in developing our people, growing our personal knowledge and improving our team’s skills which feeds the vitality of our business. 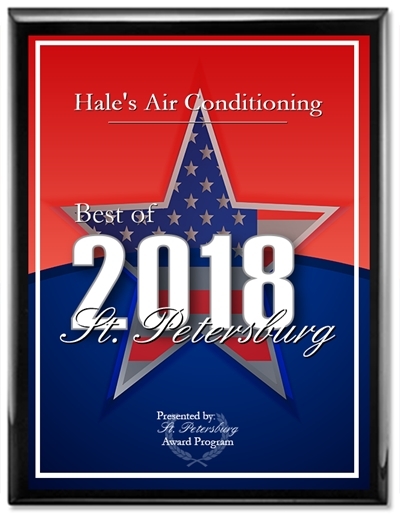 Hale's Air Conditioning has been selected for the 2018 Best of St. Petersburg Award in the category by the St. Petersburg Award Program. Read the full press release. Having a company take care of all your heating and cooling needs shouldn’t indicate that you’re stuck with any run-of-the-mill shop who cuts corners. Heating and cooling has been our passion since 1986, and it’s apparent in the work we provide to our customers. We’re committed to offering you the very greatest when it comes to all things HVAC, whether it’s service, maintenance or heating and cooling systems. Hale's Air Conditioning Services Inc has been the COOL choice since 1986, providing superior service and quality for customers in the Saint Petersburg region. We pride ourselves on being well-trained on all HVAC products, so you can be confident in our results. Our qualified technicians can give you the assistance you need, whether it be installing a brand-new HVAC system, or servicing or maintaining your existing system. Your home comfort is our top priority! We’re here to help with all of your HVAC needs or questions, so contact us at 727-369-6195 or arrange an appointment with us online. © 2019 Hale's Air Conditioning Services Inc All Rights Reserved.